Truth... I type 2014 when I typed in today's date. Well after a very, very long and much needed vacation, I'm back in the D.C. area, freezing my buns off, sipping on coffee and blogging away. I think one of my most favorite things about blogging is that it forces me to stop, sit, and think. It makes me slow down from the hustle and bustle of life, and reflect weekly on what challenges the week held and what opportunities are coming in the next 7 days. Every year, everyone likes to press the "reset button' on life in January. I've never been much of a New Year's resolution type girl, and this year isn't any different. To me, January is just another month, I never had that feeling of looking at the year ahead and thinking about what I can accomplish, what I can change, or what I can challenge myself to do. Truth be told, I think I tend to go through that closer to my birthday... not sure why, It's just the truth. Anyways, if you're the New Year, New You type, good luck, stick to your goals and push through! This week was filled with challenges, from late nights at the office to Saturday office emergencies, and having to unpack from my long vaca. Also, to top it all off, my last few days in San Antonio were plagued with a cold and a gallbladder attack, so I couldn't eat anything deliciously filled with fat. If you don't know what it's like to have a gallbladder that turns on you... it's the worst. Basically, I have to watch my fat intake for at least a month or two. So, I knew this weekend I needed to get in the kitchen and make myself some delicious meals so I wouldn't go hungry or get depressed with my limited food options and lack of late night ice cream. You'll be happy to hear that means you'll get 3 delicious recipes over the next couple of weeks that are low in fat and high in flavor! First up, Chicken Breasts stuffed with caramelized onions, dates and goat cheese served with sauteed asparagus. This meal is mouth-watering and is just as good the second day as it is the first, so take some to work for lunch and make everyone jealous of your day-time gourmet meal. 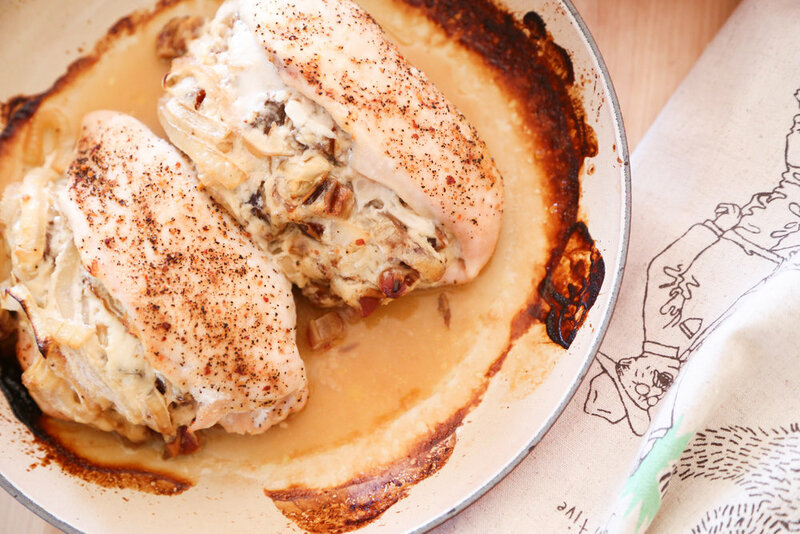 Chicken with Dates, Onions, & Goat Cheese... Oh My! When I'm cooking, I like to get everything together and organized, it makes the cooking process that much easier. The other thing I do is clean while I go... seriously, TRY IT. Chop slice the onion and get it caramelizing... Caramelizing an onion is a long, slow process, don't rush it! You'll only use half an onion for this recipe. Set the rest to the side and put it on a salad or grilled cheese for lunch! While the onions are doing their thing, cut the dates, mix the oil, balsamic, honey, garlic powder, and salt together. 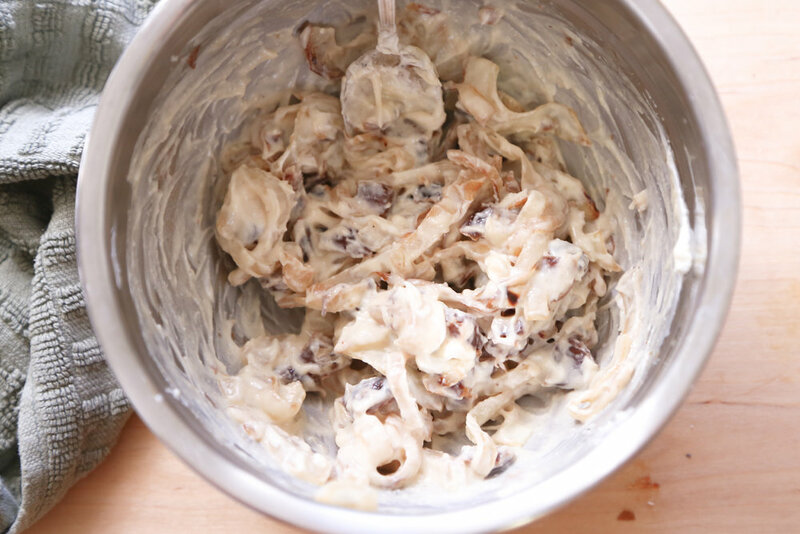 Toss the dates in the mixture, then add the goat cheese. Add the caramelized onions, give it a good stir, then set the mixture aside and prepare the chicken breasts. Cut a slit in the fat part of the chicken breast, salt the breasts and then season with montreal seasoning, or a grilling seasoning of your choice. I am loving this BBQ rub from Trader Joes. It has paprika, coffee, brown sugar, garlic, etc. I highly recommend it. I use it on a lot of different things! Stuff the chicken breast with the goat cheese, date, onion mixture and place in an olive oiled baking dish. 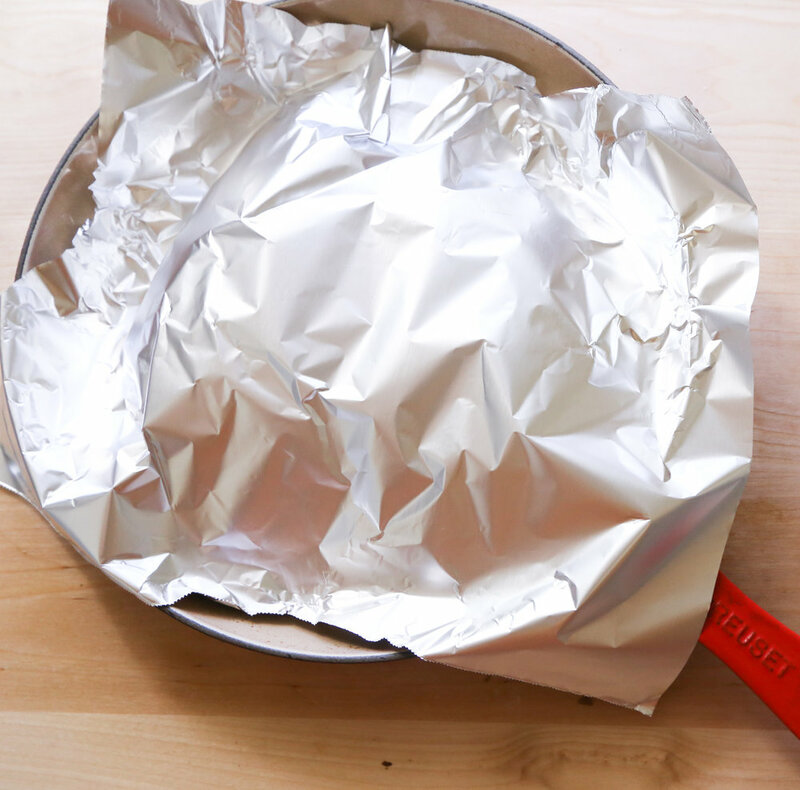 Cover loosely with tin foil and bake for 20 minutes. After 20 minutes, uncover and crank the oven to 400 degrees. Bake for an additional 10 minutes. The juices of the chicken will be clear when the chicken is done. 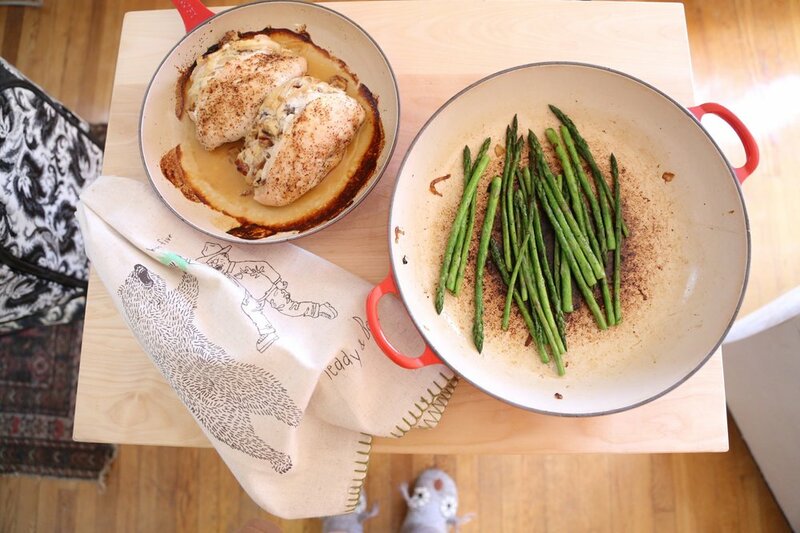 While the chicken is in the oven, make your asparagus. If you start the asparagus about 10 minutes after the chicken goes in, both should be done at the same time! I use the same pan to cook the asparagus as I did to caramelize the onions. Just add a little more olive oil and turn the heat up to medium. I cook the whole bunch and about halfway through remove half of the asparagus and save it for lunch during the week. You just want to get the asparagus you're going to reserve tender, it will be a bright green color. The reason I take it out early is so that when I reheat it during the week, it's not over cooked. It's great reheated in the toaster oven at work for a delicious and easy lunch. Are you going to give it a try? PS... not into chicken? Just use the stuffing for a great goat cheese dip with hot french bread! I saved some the other day when I made dinner, and heated it up in a ramekin the next night and dipped hot, crusty bread in it! It was AMAZING. If you're going to save some of the asparagus for lunch or leftovers, remove it before it is completely cooked. Its best to remove it right when it gets a bright green color. Let cook and refrigerate. To reheat, heat in a toaster oven, microwave, or on the stove top.